We slept in a bit this morning but were still able to make it to the planetarium in time to see the Sesame Street show: One World, One Sky. Miriam was a little nervous about going back to the planetarium last night until Andrew assured her there would be no black holes. "Thank you, Daddy!" she said, giving him a big hug. "Thank you for not taking me to a show with black holes in it!" It was a pretty fun show. Benjamin and Miriam seemed to enjoy it a lot more than the Magic Treehouse show (which was a tad scary for them, I guess). Benjamin even followed a few cues—he would point at the "sky" when we were asked to point to any shapes we saw in the sky and so forth. We also learned the Chinese word for star: xīng (星). The show was originally made for the Beijing Planetarium and so Elmo introduced us to a friend from China who showed us that the night sky is the same there as it is here. We also got to visit the moon. We stopped by the library on our way home for the end-of-summer-reading party. Unfortunately, we arrived just in time to catch the tail end of the party. 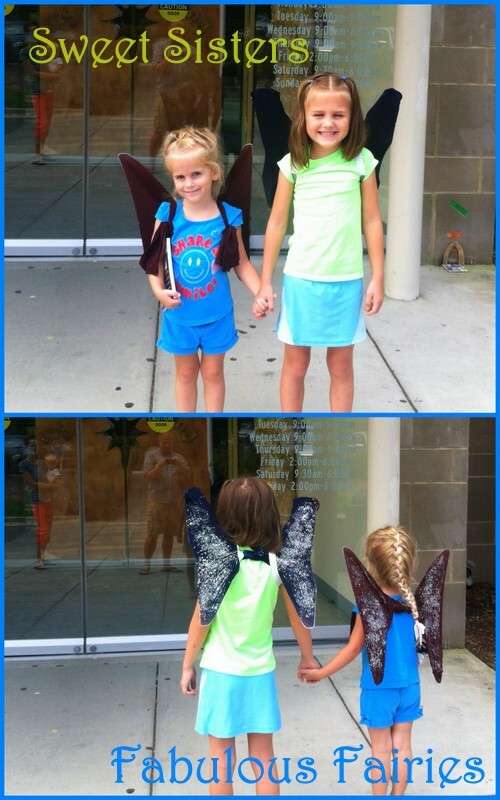 They were already busy throwing pie at the librarians, which did look like fun, but we spent our time making fairy wings at the ravaged craft table. We were fortunate to snag two of the last three wire frames (though there was still a box of hangers so I suppose we could've made our own) and the girls each chose a pair of nylons to stretch over the frames. Then we eked out enough glue to get the wings a little damp before I flipped them over and rubbed them on the table, which was covered in glitter though all the bottles were empty. We found two bits of elastic, which we used on Rachel's wings. For Miriam's wings I used some discarded bits of nylons that I found in the garbage can (that was full of fairy-making refuse, not anything gross) to tie her wings on. Both girls were pleased with the result. We declared them to be outside wings and left them on the front porch. I should hate to think of the mess that glitter would make inside the house! We also each got to choose a book to take home (for keeps). Rachel chose an Encyclopedia Brown book. Miriam chose Babymouse: Queen of the World! She doesn't know it yet, but there there's a black hole in the middle of the book. Rachel spent quite a bit of time out in the yard chasing butterflies. She caught an Eastern Tiger Swallowtail and another little one and wanted me to take pictures of her with them. It was so humid, however, that I couldn't take her picture because the camera was completely clouded over. These hot afternoons often bring summer storms rolling in with them. Today's storm was particularly long in coming. We heard thunder for over an hour before we got even a drop of rain! Here are the girls watching the worst of today's storm—at some times the wind was so strong that the branches of our crepe myrtle (you can see the foliage in the top part of the door) were touching the ground. After the storm passed, we went out to the garden to harvest some vegetables to have with dinner. Need I remind you that cicadas are about an 1.5 inches long (2.25 inches from wingtip to eyeball)? I'm suddenly quite able to understand how an ordinary garden spider can catch small frogs in its web. This spider is seriously massive, but at least I know that it's always going to be in its web and has no interest in roaming around my house. At least, that's what my hope is. After dinner we had dessert—pudding and shortbread cookies—before bath time. That sequence was no mistake. Benjamin really enjoyed his pudding (we had a hunch he would). And here's Miriam showing off her Rapunzel hair. She wants to grow it all the way down to the floor. I'm not sure we'll let it get quite that long. She was such a helpful girl today. I told the girls at lunch that they had to do a chore before doing whatever it was they wanted to do for the afternoon. Rachel threw a huge fit about wanting to read and not having enough time to read if she had to do chores first. "You have three options," I told her. "You can clean the bathroom and then you can read. You can empty the dishwasher and then you can read. Or you can clean the bathroom and then empty the dishwasher. You're free to choose any of those options; if you don't choose soon then I will choose for you and what do you think I will pick?" She chose the bathroom but griped about it the entire time she was working. Meanwhile, Miriam danced off to the dishwasher, singing a made-up song about obedience. "This is what obedience looks like. Yes, I'm just doing what I'm told. And I'm doing it happily because that's the best way to be. Oh, I'm such a good person! I never whine a bit! I just love helping my mommy clean the house and when I'm done with this job I'll ask to do another one! Why? Because I'm obedient! I love being obedient! I'm such a good girl!" I was choking back tears of laughter listening to her. Her singing was making Rachel more and more furious. "Stop singing! Make her stop singing!" Rachel screamed from the bathroom. "Mom, when I'm finished doing the dishes can I help you do another job?" Miriam skipped out to ask me. I told her that she certainly could and then whispered to Andrew, "I love it when Rachel throws ridiculous fits!" "Why? So Miriam tries to show you how angelic she can be?" It does go both ways—when Miriam misbehaves, Rachel shows off her good side. At least they don't usually gang up on me! Like I said, Rachel did a half-decent job cleaning the bathroom. She put the toothbrushes in the toothbrush holder, I think. And went through the motions of wiping down the counter, though I don't think she actually wiped anything. Miriam begged to help me finish cleaning the bathroom, so she and I scrubbed and sang until the bathroom was sparkling. Then I called Rachel in to look at the bathroom. "This is what a clean bathroom look like," I told her. "See how there are no stray bits of toilet paper on the floor? There are no gobs of toothpaste left on the counter. There are no spots on the mirror. There are no stray hair things anywhere, no dirty laundry or shoes on the floor..."
She mumbled something and left to go read again. I picked up Benjamin to comfort him. He just about had a panic attack within the three minutes I'd left him shut outside of the bathroom while Miriam and I cleaned. I soothed him and told him we'd read him a story. Miriam picked out Just a Mess by Mercer Mayer. We all snuggled on the couch to read and had barely cracked the book open when Rachel came scuttling down the hall. "Wait for me!" she said. "I want to read with you!" Never was there a more opportune time to read that story with Rachel. She kept pointing out how Little Critter wasn't cleaning his room properly but didn't seem to realize that she herself had been guilty of the very same crime only minutes before. When we were finished reading I asked Rachel if anything about the story reminded her about our afternoon. She gave me a very heartfelt apology. We had story time again before bed, of course. Miriam wanted to read The Very Busy Spider again, so we did because Benjamin loves that story, too. He surprised us all by being the first one to make an oinking sound when we got to the pig page! We tried to reenact the moment for the camera, but it's never as good as catching it spontaneously (besides which I had Rachel try filming for the first couple of takes and she kept accidentally turning off the camera before he'd oink—so we brought in Daddy—for our fourth take—and I think Benjamin was a little sick of oinking by then). If you ignore all the oinking his sisters are doing, you can hear Benjamin oinking around 0:28. That was basically our day, though I do have a few random pictures left to share. We're still getting used to it and I'm dreaming of its potential. I'm considering painting it...but I've never painted anything (besides our shed) and I don't really know what colour I want it to be and it's so ridiculously heavy. Andrew and I got it out of the van together, and up to the stairs leading to our front porch, but no further. He was certain that, together, we'd be able to make it up those stairs and into the house. "One, two, three, lift!" he instructed. I threw myself into it for all I was worth before squeaking out, "I can't! I can't! Put it down! Put it down! Put it down!" "You didn't even lift your end," Andrew pointed out. "So you don't have to put it down. You can just stop trying." I enlisted our neighbour across the street to help muscle it through the door. I believe that women can do a lot of things. Lifting that cabinet, however, was entirely out of the (my) range of possibility, but that's okay. We got it into the house and there it will stay forever because we're never moving it ever again! My sister had a spider like that on her porch the other summer. It never bothered them, and they enjoyed watching it day to day until one day it was just gone. The other day I was taking a few pictures of Zach out on the deck and thought I'd smudged the lens before realizing it was from the humidity. Mine wasn't as bad as yours though! We got that storm yesterday afternoon around 4. I went to sit on the porch and the breeze was kicking! Dropped the temps from 94 to 76 according to my porch thermometer. Myrna = Rachel ; Marie = Miriam. How well I remember!